Kara's Party Ideas | Kids Birthday Party Themes: Mele Kalikimaka Christmas Birthday Party! Kara's Party Ideas | Kids Birthday Party Themes: Mele Kalikimaka Christmas Birthday Party! Mele Kalikimaka Christmas Birthday Party! "Mele Kalikimaka is the thing to say, on a bright, Hawaiian Christmas Day. That's the island greeting that we send to you from the land where palm trees sway. Here we know that Christmas will be green and bright. The sun to shine by day and all the stars at night. Mele Kalikimaka is Hawaii's way, to say Merry Christmas to you!" OK, admit it. You're all singing the song in your head! Don't you wish we could all be in Hawaii this week?! I lived in Hawaii around 7 years ago...and oh how I miss it! 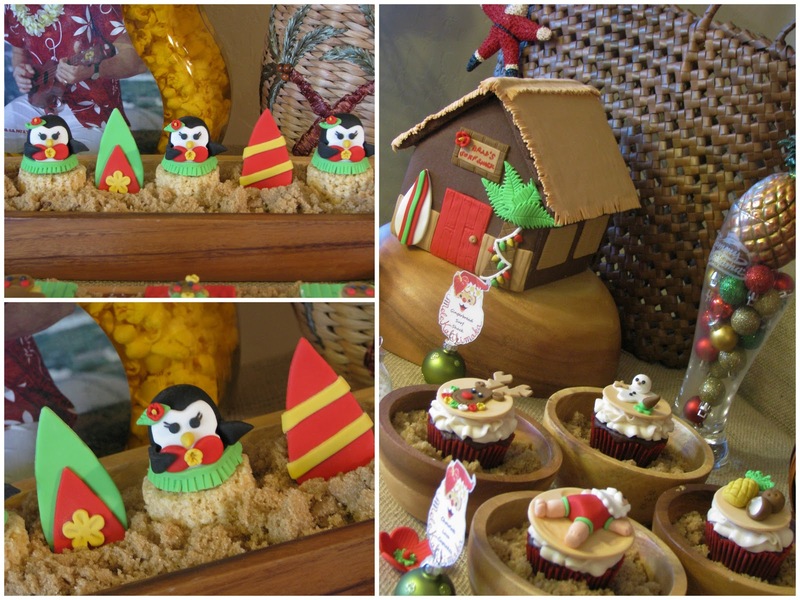 This MELE KALIKIMAKA CHRISTMAS BIRTHDAY PARTY submitted by Lynlee Beckett of Lynlee’s Petite Cakes has a special place in my heart. Isn't it just adorable? 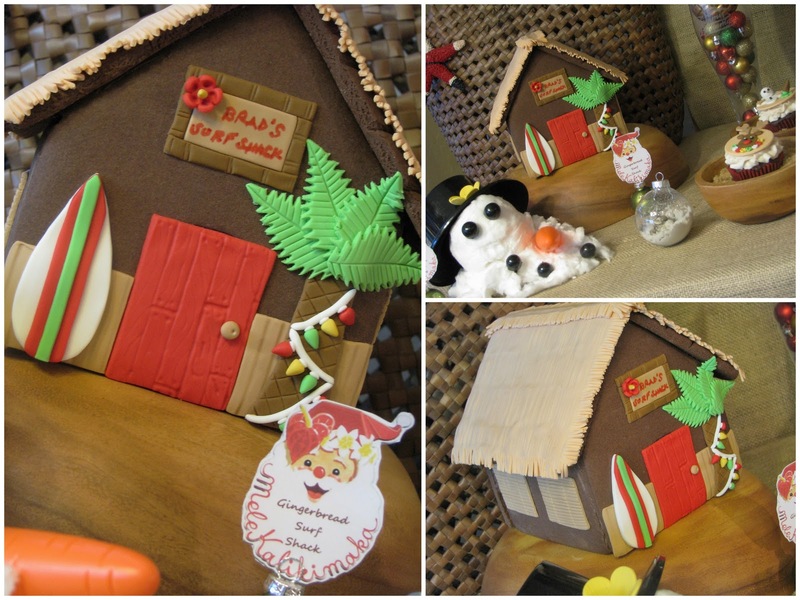 All the brown sugar for sand...the fondant surf boards, the melting snow men, the santa clause making a "sand" angel...the tiki hut gingerbread house...WOW. Oh, it's all just too cute. Here is what Lynlee said about the party- "My husband's birthday is in the month of December and since he's a surfer boy, I thought I would add a bit of a tropical Christmas theme to the festivities! I focused on tropical, Hawaiian-inspired decor by pairing traditional Christmas colors of red and green and some yellows/golds for a pop, along with neutrals to reflect the sand and natural elements. I utilized burlap fabric as a table covering, along with a strip in the center of the background that not only added some texture, but also hid a cabinet in our dining area! Following along with the melding of island life with the holidays, I took the traditional gingerbread house and converted it into a surf shack! To save time, I purchased an already baked house and added fondant decorations, such as a palm tree with a string of lights. When I was browsing through the "dollar" aisles at Target, I found some accessories to decorate your own snowman, so placed it on some white cotton candy to show it melting in the hot, tropical sun! The adorable "Mele Kalikimaka" Santa tags came from Starynight...they were free graphic downloads for digital scrapbooking! The little ornament holders came from Michaels, which I found at 50% off in the dollar section. 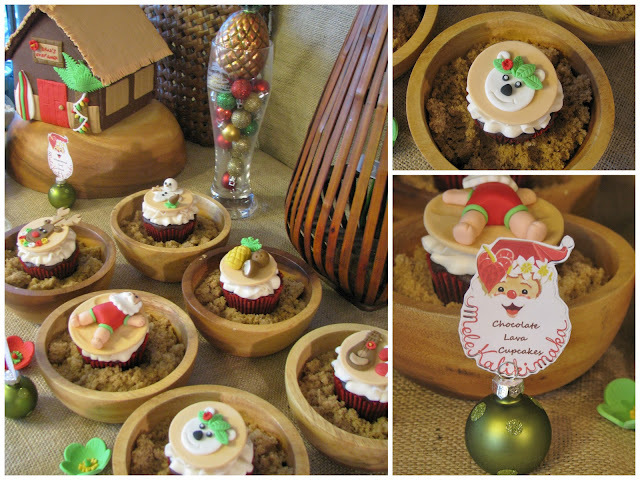 The fondant cupcake toppers included Santa making "sand" angels and Rudolph wearing a lei, among other tropical and holiday designs. They topped chocolate "lava" cupcakes and were displayed in wooden bowls with brown sugar to resemble sand. Some other treats offered were pineapple cakes topped with fondant gingerbread men and women, decked out in their bathing suits and laying out and catching some rays on their fondant towels. We also had rice marshmallow treats serving as a stage for the hula dancing penguins, along with fondant surfboards and flowers! As favors, we gave away Egg Nog in a Bag from Cost Plus World Market that, as the bag reads, you can simply "shake, freeze and squeeze"! Also from the Target dollar bins were some liqueur-infused chocolate boxes. I had so much fun with this theme that was so fitting for both my husband and the holidays! We, of course, listened to Bing Crosby's classic "Mele Kalikimaka" song since it's Hawaii's way to say Merry Christmas to you!" Aloha! Darling idea! Love the melting snowman! Owwww. this is way 2 cute! Oh my gosh! This is so adorable!!! wow! very cute! i started following your blog since it was a blog of note. 'mele kalikimaka' is something i'm saying this year, and every year as i'm lucky to live hawaii. hawaii misses you! I'm so loving this party!! What a great idea! I loved it very unique.